Not Dogs: Not Dogs Needs You! 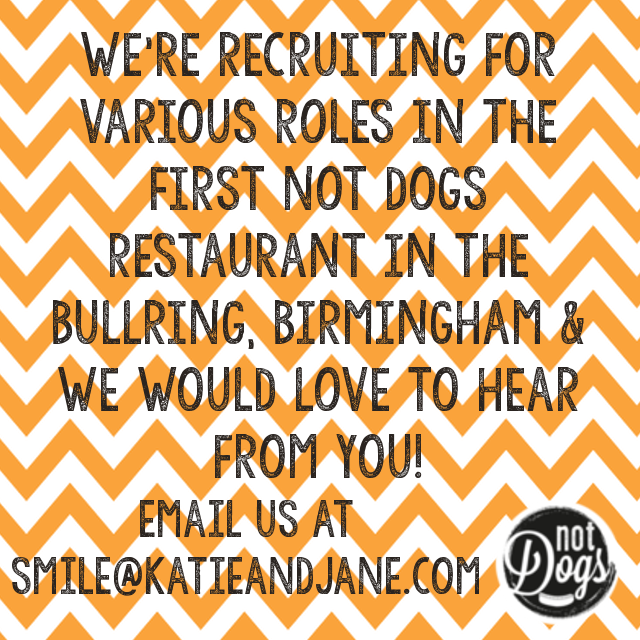 We know, we’ve been chatting about it for a while now…the Not Dogs restaurant is on its way, and we are looking for a passionate team of people to join our Crew! Not Dogs is known for putting its customers first and delivering exciting, unique vegetarian fast-food and we are looking for people who effortlessly want to create positive associations with the Not Dogs brand and genuinely want to brighten up a customer’s day. We are on a mission to make fast-food meat-free and we hope with every step we take to help people access Not Dogs on a regular basis we will achieve our dream of Not Dogs going global! But ‘Big Things Often Have Small Beginnings’ and we plan to celebrate every tiny victory that our crew help us to achieve on our Not Dogs journey. In 2014 we sold our first Not Dog and we spent two years travelling around the UK in a little purple zig-zagged food truck perfecting our product and meeting Not Dogs fans, taking hundreds of #SausageSelfie pictures. Now our crew will join us at our greatest moment to date, the first of many Not Dogs restaurants! If this sounds exciting to you then we'd really like you to get in touch & send us your C.V.
Email smile@katieandjane.com and we’ll send you all the application details!